Holy crap, it's Friday ALREADY? These past few weeks have just been flying! Well, I guess it's time for BOOK CLUB FRIDAY! You know the saying, "You shouldn't judge a book by its cover?" Well, that saying totally screwed me. If I had judged Bikini Season by its cover, I never would have picked it up and proceeded to read the most frustrating book ever. I explain my reasoning a little later on in my review. 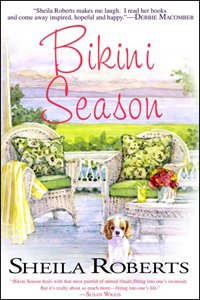 I had so many problems with Bikini Season that it's difficult to write a review without ripping it to shreds. I don't enjoy doing that, but it pissed me off, so I'm going to consciously try to hold back my bitchy tongue. Spoiler Alert: I'm not very successful. So, this book claims to be about The Teeny Bikini Diet Club, which is made up of four women: Erin, who's getting married; Angela, who fears her husband is having an affair; Megan, an overweight lawyer with low self-esteem; and Kizzy, who's husband tries to sabotage her diet efforts. Sounds good, right? It did to me! Rest assured, though, this book isn't about the struggle of losing weight. Instead, it's mostly about Erin and her imminent wedding. The problem is that Erin is a very indecisive and flighty character who I had zero connection to. In fact, she kind of sucked. Side Note: You know what I HATE in women's fiction? Women who don't feel great about themselves, meet some wonderful guy, and then are flooded with self-esteem. ARG! Not only is it condescending, but it makes me want to pull out my weave (if I had one). And it's not only Erin who falls into this category. Megan's just as bad. The book claims that all of the characters, aside from Kizzy, are in their late twenties and early thirties. As a soon-to-be-30-year-old, I had a really hard time believing the characters were supposed to be my peers. I can't quite put my finger on it - it may have been the way they spoke, or the way they thought, but whatever it was, they weren't authentic. As I read, I pictured them in their late thirties to mid forties. Being reminded every-so-often that they were, in fact a decade younger, just frustrated me. Then there's poor Kizzy, who really couldn't be more of a stereotypical middle-aged black woman. From how she speaks to how she acts. It was bad. Hence my reference to judging a book by its cover. Let's look at it again, shall we? Does that really scream late-twenties? It's a watercolour! Where's the shiny-ness? The bright colours? On some other cover, that's where. Maybe if Erin was one thousand percent more likeable, I'd care that she's going to marry the wrong guy, but since I really didn't care about her, the book fell flat. Especially because the last seventy pages are dedicated to her story, alone. Plus, the whole time that the other characters are running around, trying to push Erin into the arms of another guy, nobody once mentioned why ANYONE want to marry HER! Erin was THE WORST! I didn't even want to be her friend, let alone spend the rest of my life with her. Frankly, her fiancee dodged a bullet. And Angela? Well she's just as ridiculous as Erin - riddled with insecurities that don't really make sense. That being said, the ending to her story put Angela in her place and I appreciated that one teeny section. The last pages were VERY hard to get through as Ms. Roberts basically stole every been-there-done-that women's fiction 'surprise' ending. Like, EVERY ONE...and then she put them ALL TOGETHER. By the time I got to the last page, I wanted to throw it out the window. And then run over it with my car. Twice. This book was a serious bait-and-switch. Don't fall for it, people! Run away! On the upside, my disappointment in Bikini Season sent me back into the trenches of the "discounted fiction" section of my local bookstore and I found a Canadian chick-lit author! Her name is Chantel Simmons and I'm going to start her newest book today. Hopefully it's INFINITELY better than this one! I hate when a book is disappointing, but this one sounds down right awful! I appreciate your honesty! HAHA! Mei, you hit the nail right on the head! I'm happy to read that I'm not the only one who thought that!